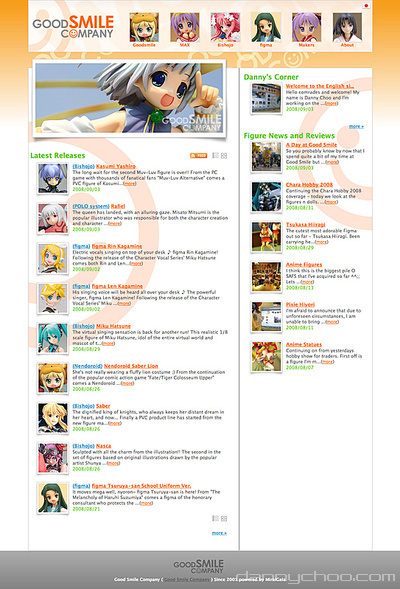 Danny Choo has announced Good Smile Company Beta English website. Members of Danny Choo are the first to know about it. Translations were done by members of Danny Choo, not just any member but “recruited”. If only I learnt Japanese and applied for the role, but the set back would be the overflowing of figures that I receive each month. In the following weeks, the Japanese version will be out. English comes first the viewers on Danny I guess. In the mean time, the website is opened to suggestions, improvements and such. If you found an bug, or want to voice an opinion, log onto DC and post an comment at this post. The website is running on an brand new Mirai Gaia platform while DannyChoo.com is still running on the old version. He also states that the website may have some bugs here and there. You can email him about bugs or so at Danny@Goodsmile[dot]jp. So far, I haven’t seen any bugs. His a good web developer… good work! The website still have many more things to roll out, such as drop down menus or breadcrumbs etc. Besides the website, Danny mentioned that Good Smile is planning to spread their products to more international terrortories. (If i’m not mistaken). This is probably good news to some people who can’t import figures or Figmas. One thing that Danny beat me to is the image rotating banner that I planned to have on my portfolio website. Mine would show some of the work I did instead of figures. Great minds think alike no? Though, the design influenced me a lot over the time spent on DC as well as on BBC.